Remember that feeling of grim resignation when your mom would buy you ASICS sneakers instead of the Air Jordans every kid in school is wearing? Or when the waitress asks, “Is Pepsi OK?” According to a report in Variety, France’s ON Animation Studios and U.S. distributor Cross Creek are hoping to somehow make millions by engendering that feeling among fans of The Lego Movie. In the wake of The Lego Movie‘s $468.8 million global box-office haul last year, production and distribution rights are officially a lock for Playmobil: Robbers, Thieves & Rebels. As we previously reported, the movie is being written and directed by Bob Persichetti, whose background is largely as a story artist for various Disney and DreamWorks cartoons. He did co-wrote the screenplay for ON’s adaptation of The Little Prince, which was well received on international release though has yet to come out stateside. U.S. distribution for Playmobil: Robbers, Thieves & Rebels reportedly followed a number of global distribution deals struck after a presentation at the Toronto International Film Festival. Production is now underway on the $75 million movie whose backers, Variety reports, hope it will be the first installment in a whole Playmobil franchise after it comes out in late 2018. 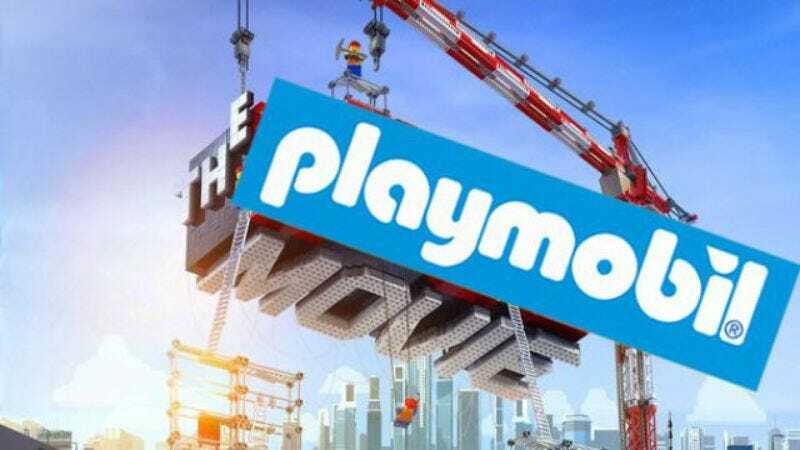 With the Playmobil rights now locked down, studios are presumably hungrily circling the likes of Lincoln Logs and Tinker Toys to build a shared cinematic universe populated by toys slightly less fun than Lego.